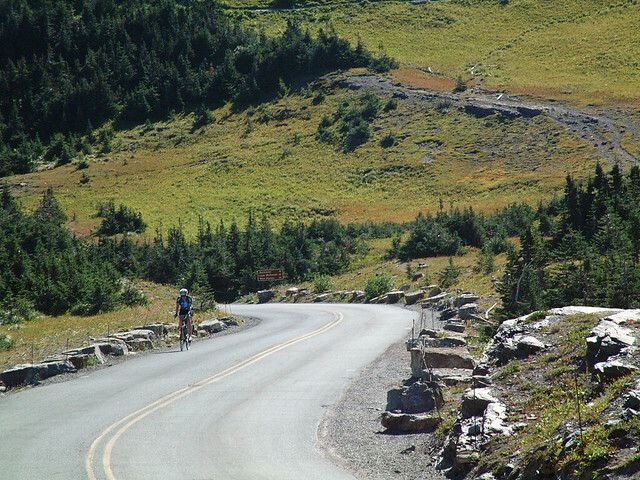 The climb up the Going To The Sun Road to Logan Pass and the Continental Divide was the most anticipated part of the tour, except for the fact that we had to wake up well before dawn to give ourselves enough time to enjoy the scenery and still make the summit before 11:00. For some folks that’s not a big deal; me, I prefer starting rides at 11:00. After a rude awakening, I sluggishly got dressed and joined the others at a sluggish breakfast. I took a few beach pictures to document how absurdly early we were starting out, and then we began loading up the bikes to head out. My sluggishness continued as we hit the road, so after a couple minutes warming up my muscles in the chilly morning, I sprinted off the front and hammered for a little while just to wake myself up. It worked, too—by the time I pulled off to shoot some pictures, I had regained some measure of alertness. The photo opportunities along this road are astounding. 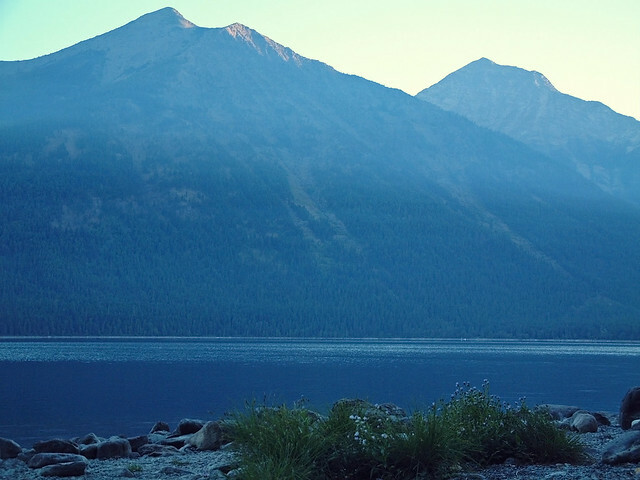 Not long after leaving Lake McDonald, I found myself completely surrounded by breathtaking peaks. 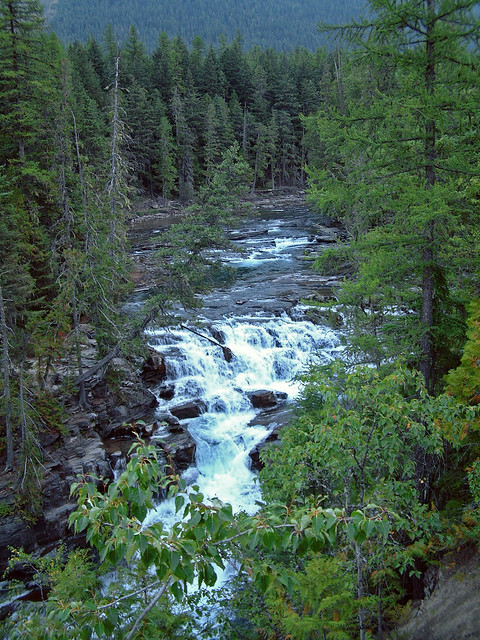 The road parallels the Sacred Dancing Waters, a crystal-clear river cascading over jumbled granite, and there are a number of turnouts where you can get views of various waterfalls and rapids. The lighting conditions were somewhat troublesome for photography—they call it the Going-To-The-Sun Road because you don’t get to see the sun until you’re near the top—and I was glad I’d brought my tripod. My shots still had something of a blue cast, but Photoshop can mostly fix that. The group was leapfrogging as each of us spent time looking at and photographing different aspects of the ride. The road was gradually climbing, but we could see ahead of us the Garden Wall, and the upper spur of the road we’d have to climb. There were frequent turnouts along the Sacred Dancing Waters, and we could no longer see any gap back in the direction of Lake McDonald—the whole world was just this road through the peaks. A local jersey pro came hammering by us, and I jumped on his wheel and then rode along with him for a while, talking about living near Glacier and getting to ride this road all the time. When I started to tire, I used Mark’s excuse from yesterday (“I’m gonna take some pictures [pant] thanks for the ride”) and got some more food from the van. As the road turned to the northwest, the climb began to assert itself, and we started to crawl out of the valley and up to the sun. The terrain became more mountainous, and we encountered the first tunnel on the road, where we stopped to take in the view and handle the necessities of nature. Shortly after the tunnel we encountered The Loop, where the road switches back almost 180 degrees while beginning to climb in earnest. (“Climbing L’Alpe Du Wheeze!”, Mark suggested). We still weren’t in the sun, but the temperature was climbing, particularly for the bicyclists, and most of us started stripping off layers. Each turnout provided a view more breathtaking than the one before, so we also stopped a lot for pictures. My tripod got a workout on a couple of panoramas. I was so overwhelmed by the place that I really can’t remember any of the bicycling; I kept a leisurely, almost casual pace and just watched the world roll by. This late in the season the wildflowers weren’t too prolific, but there were enough left to add some nice color to the landscape. We still had a deadline—we had to be to Logan Pass by 11:00 AM. I intended to use every minute of our allotted time on the way up; the climb was an experience I wanted to savor. However, a monkey wrench was thrown in the works when we found the road ahead blocked by an earth mover and a dump truck. A landslide was being cleared away; the road was only one lane wide, and that lane was completely blocked by the dump truck. Everyone caught up and waited impatiently as the dump truck got filled over a period of 20 minutes. Finally it was full, and we were allowed to ride through before the waiting cars. It still seemed there would be enough time to make the summit, so we relaxed a little. We finally Got To The Sun at a parking area and trailhead within sight of the pass. Paul got there first; I arrived shortly after, at about 10:30. Nancy (the birthday girl, it turned out) was not far behind me, and Mark and Suzanne, riding together, still seemed to be making good enough time to beat the deadline. I hung out for a while below the pass, looking for mountain goats. We saw a funny standoff on the trail along the Garden Wall; a mother goat and her kid were walking along the narrow trail, and a large group of tourists was walking the other way. Neither had room to move around, so they stood there, staring at each other, for a good 5 minutes. As is so often the case when the needs of wild animals conflict with the needs of man—even in our national parks—the standoff was resolved when the animals got out of the way. 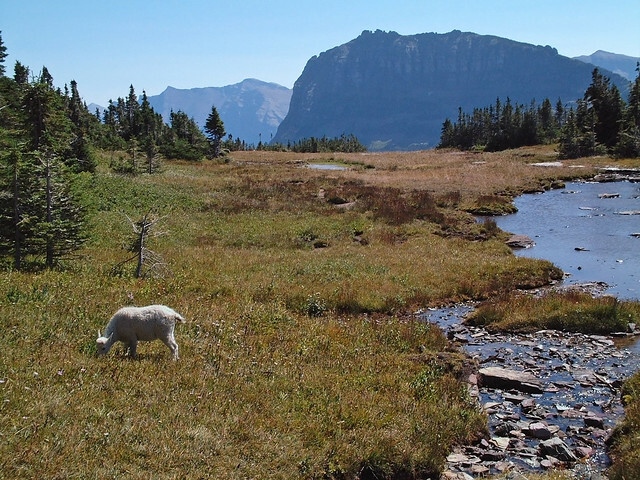 Logan Pass is an incredible place to arrive by bicycle. In the morning we started in a heavily forested riparian zone, then climbed along a rocky and forbidding cliff, but now we were in a lush and green alpine meadow, surrounded by wildlife and peaks. There was a clear sense of giddiness in the group as we all took pictures, posed at the Continental Divide sign, and generally acted like tourists. The exertion of the climb was forgotten in our wonderment at this amazing place. 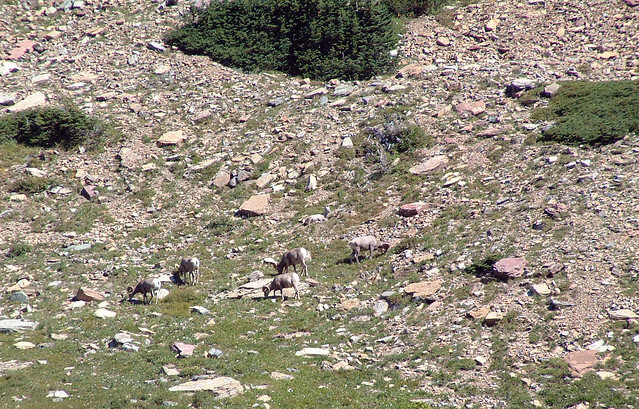 In addition to the mountain goats, we saw a group of bighorn sheep with remarkably effective camouflage on the hillside across the road. It took quite a while for all of us to see them, even while we were standing in a group trying to point them out to each other. The problem is, they look like rocks, and the only reference points out there were other rocks. “You see it? It looks like a grayish-brown rock…it’s right below the brown rock and to the left of the gray rock.” I think we all saw them eventually, or at least claimed to. It was like looking at one of those 3-D stereograms at a party. Mark even claimed he saw two of them head-butting, but I think he was delirious from the altitude. Continuing in the “tourist” theme, most of us decided to take the 2-km hike up to Hidden Lake. Paul wasn’t feeling well and decided to ride on ahead. The rest of us walked on a well-travelled boardwalk which brought us still higher in the mountains and eventually to a platform overlooking the lake and its hanging valley. (Nola was enthusiastic about the geology of Glacier and kept us informed about all the real-world examples around us). On the way back we saw a nanny goat and her kid feeding right by the side of the trail, unbothered by the legion of tourists taking pictures. It seems like a debasement of the very concept of “wildlife” to have a dozen people surrounding it with cameras, but I didn’t allow my vague moral objection to stop me from taking pictures of my own. There was another panoramic overlook back towards the pass as we were coming down; I set up the tripod one more time, and then scurried down the rest of the trail to catch up with the group. We had a lot more riding to do today. The rest of the group pushed off before I did, but the rest of the group didn’t have 53×12 top gears and the desire to use them. We were going to give back almost all the altitude we’d gained so far, and that meant one thing to me: speed. On the way down I briefly saw a couple of group members as a blur on the side of the road. I think they’d stopped to look at St. Mary Lake, and I’m sure it was lovely, but I’ll have to get the postcard, ’cause I don’t pull over when I’m in a tuck at 70kph+. Once I got to the bottom of the descent, I did pull over, for I’d developed an annoying squeak, which turned out to be one of the allen bolts holding my rack to the frame coming loose. The bolt was in an awkward position due to a conflict with the brake mechanism, and I couldn’t really fix it on the road. Julie caught up to me while I was checking it out, and then after I got underway I heard Suzanne shouting at Julie to come back. (Those Texans can really shout). I circled back around to investigate the calamity, but it turned out to be just Mark with another one of his flats. They were set for tools, so I started up again and began doing some cranking. The terrain on the other side of Logan Pass reminded me, somewhat incongruously, of San Simeon, and it put me in a similar riding zone; big ring, tucked in, making good time. I blew through St. Mary and headed north on 89. 89 was a major road, four lanes, but with good shoulders and much less traffic than US 2 and 40 on the other side of the park. The terrain was flatter but still interesting. I kept cranking, and caught up with Nancy just before the Two Sisters Cafe, where we both just had to stop, if only because “ALIENS WELCOME” was painted on the roof. In the strangest of places, if you look at it right. Two Sisters was quite an anomaly out in the middle of nowhere. (“Near Babb” is how it describes its location). The paint job alone was notable, but more unexpected was “Mars Hotel” on the sound system. What really was odd was they had a concert poster on the wall from the 1991 San Francisco Blues Festival, which happens to be the only one I’ve attended. 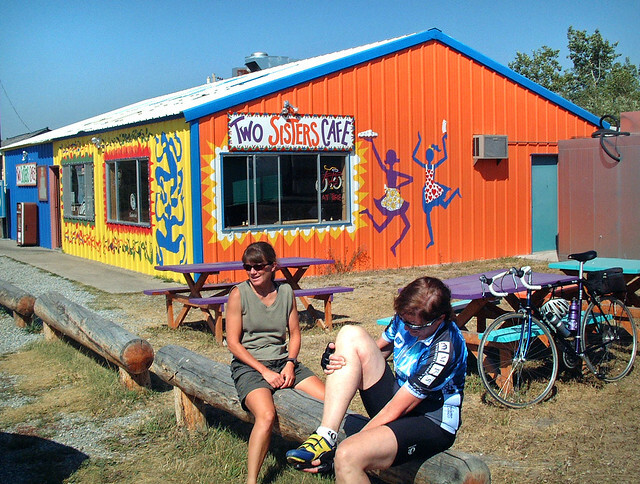 Two Sisters is where the Great Huckleberry Debate started. As previously mentioned, people in western Montana take their huckleberries seriously, and you can’t open a menu around Glacier without seeing three huckleberry items. Well, Two Sisters had a clipping on the wall from a researcher who claims that Montana’s huckleberries are not true huckleberries, but rather are members of the blueberry family. Since we didn’t have internet access we couldn’t verify this one way or the other at the time, but it became the topic of much debate, mostly centering over how much of a geek one had to be to care about the issue. I set off alone at a good pace, and 5 kilometers north I made the left turn at Babb towards Many Glacier. 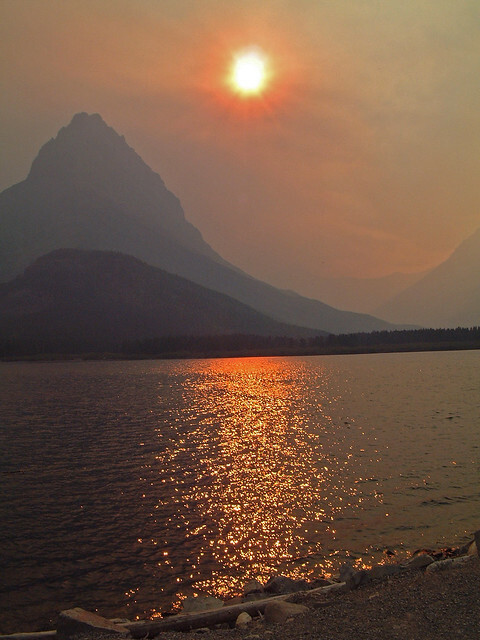 Here we felt the first real effects of the fires burning to the west; quirks of geography and weather had blown much of the smoke into the valley I was now riding through. Visibility was falling and there was a mesquite smell in the air. The actual fires were 50 kilometers away, but I was still worried about the implications for the rest of our tour. Then up ahead I saw several cars pulled over in typical bear-jam fashion (cameras out, looking and pointing). Someone had seen a bear run across the road, but lost it in the bushes. 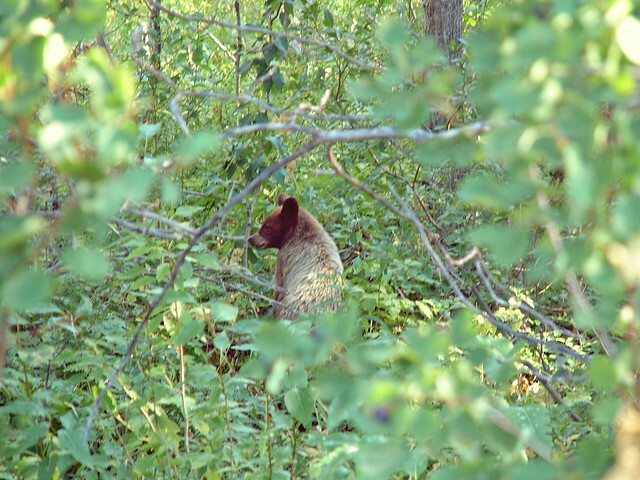 I pulled over and got my own camera out, and found the bear sitting in the underbrush just off the side of the road, not 2 meters from me. He was a little guy, maybe a year old black bear, and didn’t seem bothered by the lookieloos. He got up and sauntered into the woods, turning back to look at us once or twice. The lighting conditions were poor, but I wound up with one decent shot, and a thrilling experience. In the Bay Area, I’ve never seen anything more exciting than a coyote—here, in one day, I’d seen mountain goats, bighorn sheep, and now a bear. I continued up the gradual grade and into heavier smoke, and I began to notice some irritation when breathing. Fortunately I didn’t have far to go; I was glad to park my bike and get inside. Paul had been in for a while, and Nancy wasn’t far behind me. Mark and Suzanne made it in a bit later without incident, and without sagging. The heavy smoke muted what would have been a beautiful landscape. More than one tourist was overheard trying to back out of their reservations; there wasn’t going to be a lot of hiking done from Many Glacier this week. Enough people had been driven away that the lodge restaurant was mostly empty, and we got a good corner table near the windows. The sunset cast an eerie orange glow over the lake. Despite the emptiness of the restaurant, we got very slow service, which kept me from taking sunset pictures. We finished dinner shortly after dusk, and, exhausted from the long and exhilarating day, retired early to our rooms for rest and recuperation.